The positive metal powerhouse DEMON HUNTER announce the imminent arrival of a simultaneous dual album release set for early next year. March 1st, 2019 will see the christian metalcore band separately release the ‘War‘ and ‘Peace‘ albums, a pair of follow-ups to their 2017 offering, ‘Outlive‘. In addition to being available individually, the two records will be sold in a deluxe edition hardcover book, with both albums sporting an unspecified bonus track on each. There are now singles from each record available for streaming at this time, and speculation that the ‘War‘ material would be heavier, more aggressive, while ‘Peace‘ would provide melodic, lighter fare, seems to be validated. 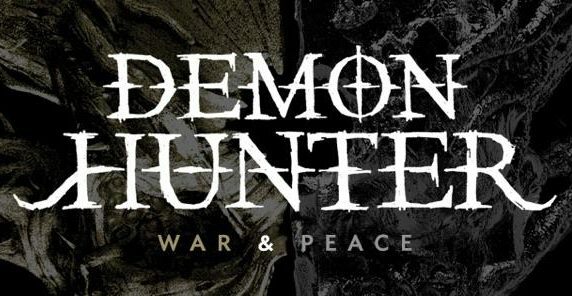 This is clearly an easy feat for DEMON HUNTER as they, in the past, have repeatedly established themselves as a band that easily navigates a wide spectrum of metallic intensities and aural dynamics. You can check out the new singles “On My Side” and “Peace“, along with the newly revealed ‘War‘ and ‘Peace‘ album covers and track lists, below. We will bring further news and info on these upcoming releases as they become available. Pre-order for this pair of albums is active now at this LINK. Also, after two years in the making, DEMON HUNTER recently relaunched their revamped fan club community, “The Blessed Resistance“. There are tons of items of various types being offered to members, including discounts on purchases and much more. Visit the group [HERE], while the video below provides more insights to what membership provides.